The T60 is the tender for the C60. 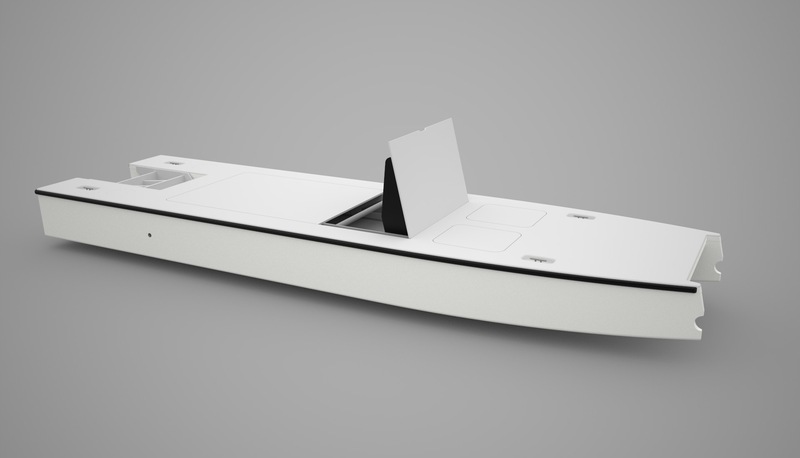 Counter intuitively perhaps, a big tender is a good fit for the harryproa philosophy of making boats simpler, lighter and cheaper as only one engine is required rather than 2 or 3. It is also safer because it is more stable than the typical inflatable or small tender. The advantages are many: taking the crew and dive gear out to the reef, a spare anchor upwind in a gale, all the shopping, water and fuel in one ride, waterskiing, boarding from the side without fear of capsize and rapid emergency rides from remote anchorages to civilisation, to name a few. It can also be a money saver: the ability to anchor off and access the shore by tender frees you from the tyranny of marinas. At 200 kgs, the T60 is not light, but fitting wheels (and electric drives for the truly lazy) is not difficult. For the rare occasions where a small tender is required, an inflatable can be carried as well. The drawback with a big tender is storing it. Harryproas overcome this by mounting it between the beams where it forms part of the bridgedeck. With the fold down roof and console, it is a flat surface that can be walked on. Fold up the console and lower the stern into the water and it is the prime mover for the mothership. In calm water, only the outboard bracket needs to be lowered. For single handing, the engine controls can be lead to the mothership wheel. The tender is attached to the mother ship by 4 lifting lines, all of which are connected/disconnected without leaving the helm. The boat is then pulled under the beams and lifted into soft mounts using the mothership’s winches and the lines cleated. Loading and unloading equipment and passengers is a much easier proposition than over the side of a small tender onto a transom scoop. 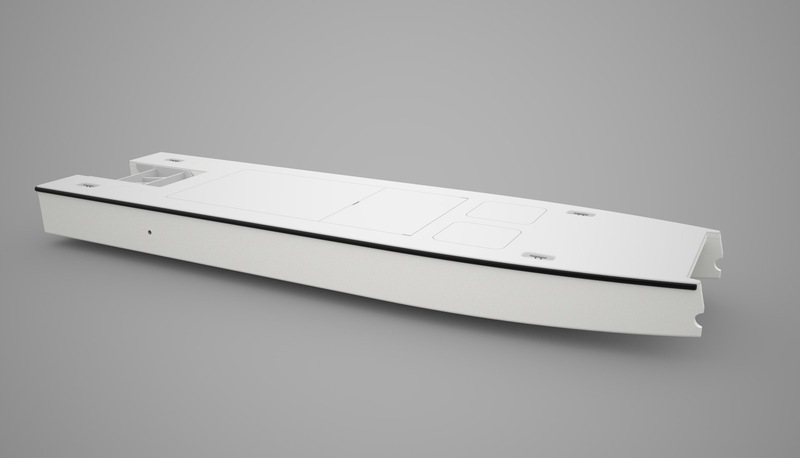 The low drag hulls and flat decks are easily built using Intelligent Infusion. Larger and smaller versions are used for other harryproas where appropriate. The standard layout seats 6 people sitting on the cockpit sides and a driver at the console. Another option is fold down saddle seats for longer journeys. 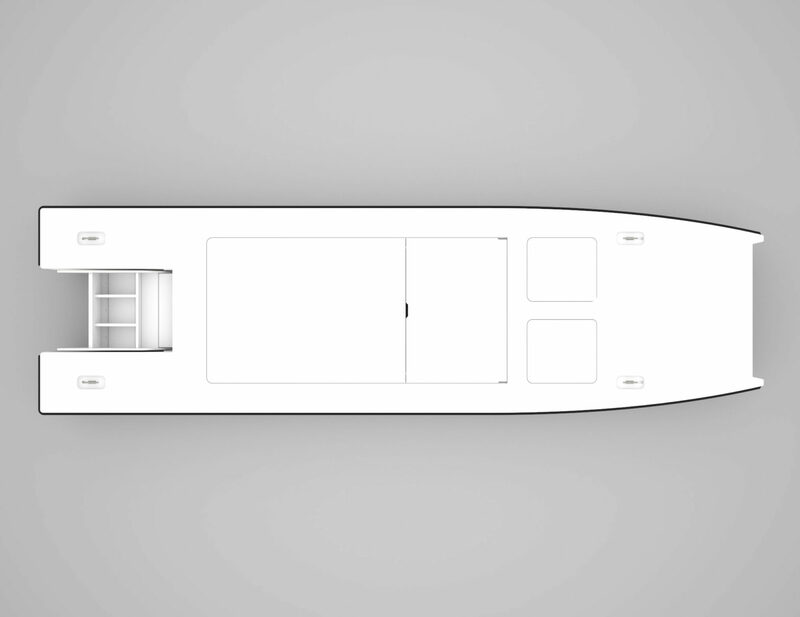 The fuel tanks/batteries are centrally mounted in the hulls, with large lockers fore and aft. 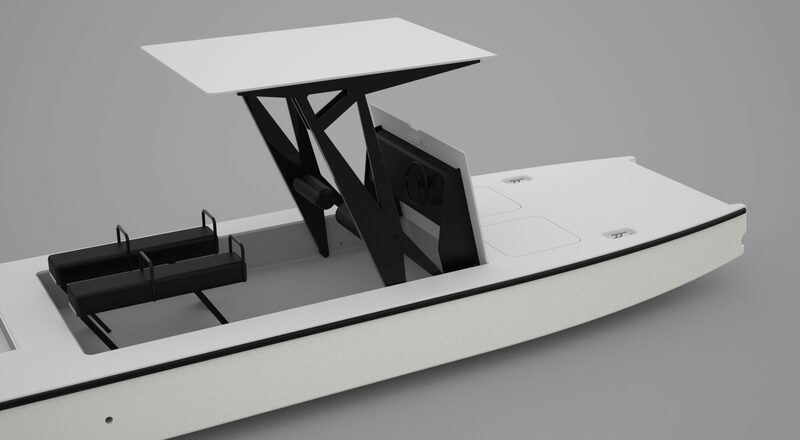 The helmsman is sheltered behind the console and windscreen, with a comfortable seat or backrest from where he can attach or remove the lifting lines. Alternatively, the boat can be steered using the outboard tiller. 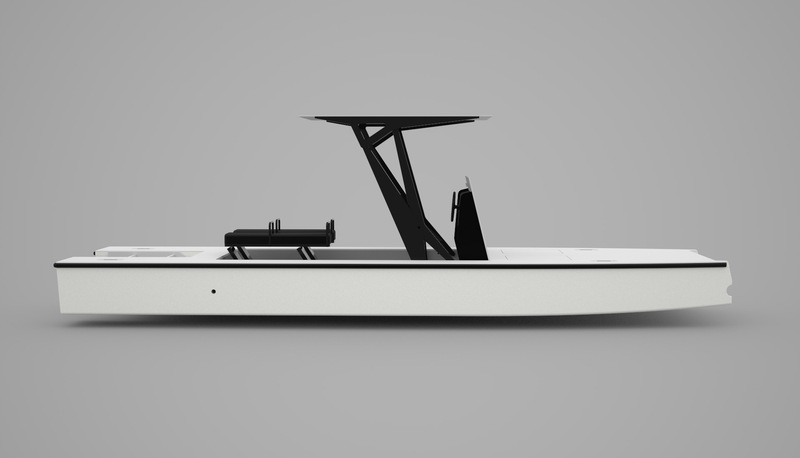 T60 is 7.5m/25’6″ long, can handle a 50+ hp outboard (diesel, petrol or electric) and comfortably carry 6 people. 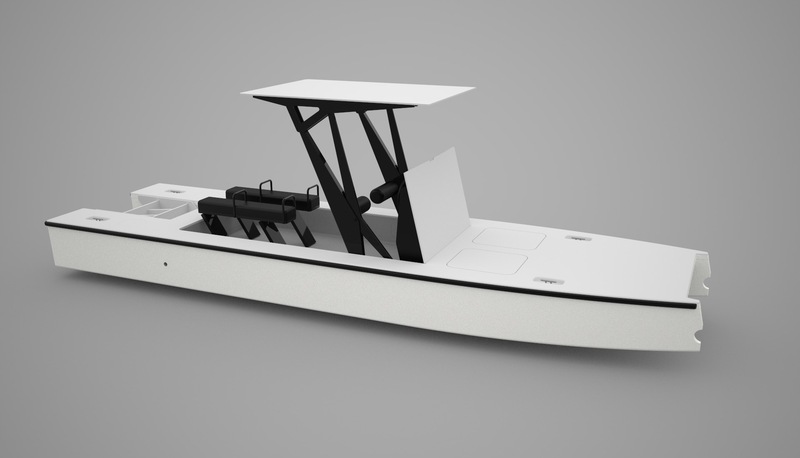 When stored between the beams, the stern can be lowered, allowing the outboard to be used to propel the boat, saving the weight, drag, cost, interior space, draft and hassle of in hull engines and saildrive or shaft propellors. The T60 is built using Intelligent Infusion. The hulls are built in a simple mould, the rest on a flat table to reduce build time and weight and increase the quality of the product. The mould and table do not require polishing or waxing. Spacers, core and fibreglass are accurately laid, then vacuum bagged. The foam is cut with a utility knife, the glass with scissors. There is no heavy lifting and no rush; the work can be spread over several weeks if required. Once the bag is sealed, resin is mixed and sucked into the laminate, resulting in a perfect resin/fibre ratio without the builder having to do any work. When cured, bulkheads are glued into landings in the infused hull halves and the deck added. There is no cutting or grinding of cured laminate, filletting or wet laminating.